Khashoggi and Ben Barka: Victims of Rogue Leaders or Rogue Systems? Photo of Brasserie Lipp, with a plaque remembering Mehdi Ben Barka’s disappearance. 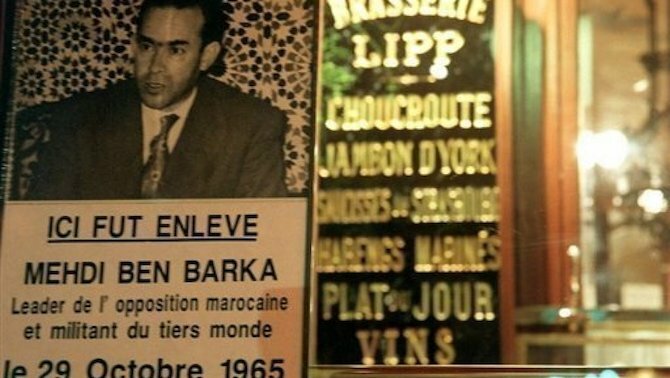 Ben Barka, a famous Moroccan opposition leader, was abducted and murdered in Paris in 1965. The tragic death of Saudi journalist Jamal Khashoggi was an eye-opener, directing the world’s attention to Saudi Arabia’s inner dynamics and regional policies. Yet, in assuming that Khashoggi’s ominous fate was caused by a power-hungry, wayward and rogue prince, this attention has failed to see that what happened in Istanbul was but a microcosm of an entire region’s political saga. The focus, therefore, on the need to remove from power Saudi Crown Prince Mohammed bin Salman (commonly known as MbS) is a misguided panacea for an incorrect diagnosis. First, political leaders are not born in a vacuum. In reality, superordinate political structures create not only policies and ideologies, but also, over prolonged periods of time, dominant mentalities, prevalent outlooks and modes of behaviour. As such, it is the rogue regimes and mafia-like systems of government that, more often than not, act as incubators for rogue leaders and madmen, not the other way around. MbS is a prime example – he is the son of an authoritarian political structure, not its creator. Even if he and his henchmen are sidelined, the system will in all likelihood spawn a replacement. History has clearly illustrated that leaders’ idiosyncrasies are less consequential than the nature of the political structures in which they operate. Suffice to say that under the rule of the colourless and politically unambitious King Khaled (1975–82), another prominent Saudi dissident, Nasser al-Saeed, was kidnapped in Lebanon, transferred to Saudi Arabia, brutally tortured and then thrown out of a plane. Second, in the largely authoritarian Middle East, Saudi Arabia is hardly an anomaly. Whether archaic absolute monarchies, princely states, or republics of fear run by securitocracies, these countries have been, since independence, hijacked by an alliance of politicians, business elites and intelligence barons who impose their writ without pity on nations they treat like family heirlooms. Under their rule, extrajudicial killings, summary executions, horrific tales of torture and human rights abuses have been the norm, not the exception. It is remarkable, for example, that the hit squad that murdered Khashoggi followed the same pernicious script used by Moroccan intelligence officers against a prominent dissident six decades ago. In 1965, Mehdi Ben Barka, a Third World leader of the stature of Che Guevara and Jawaharlal Nehru, was kidnapped from his Paris exile and brought to the Moroccan capital, where he was tortured and his body dissolved in a 1.5-meter-high and 2.5-meter-wide tank filled with acid. Dozens of Moroccan dissidents, we now know, perished in the same tank between 1961 and 1967. In the same vein, Gaddafi’s Libya (1969–2011) established a sophisticated system of torture, composed of a hierarchy of multiple units, each featuring command structures and bureaucracy. In Ba’athist Iraq, the system’s brutality did not spare the president’s close relatives. In the mid-1990s, two of Saddam Hussein’s sons-in-law who had defected to neighbouring Jordan were promised immunity; both were eliminated immediately upon their return. While these regimes project an image of being imperfect but improving, to believe this would be to take the drapery for the substance. These cases, and countless others, form a pattern that reveals what lies behind the façade of modern-day governance, vast bureaucracies and diplomatic niceties: a deep-seated thuggish mentality. In essence, these regimes share, to a striking degree, many of the predatory characteristics of criminal gangs, including the reliance upon violence and intimidation to resolve differences, personal rule underpinned by secrecy and opacity, perverse disrespect for the law, and, needless to say, lack of accountability. Under gangsterism, the rule of law is a farce; rulers turn into untouchable deities, polity is an act of collusion, security agencies are the only functioning institutions, and fear, immense and pervasive, reigns. Marred by illegitimacy and wary of dissent, politics in the Middle East has not been about allocation (who gets what when) or competition among social forces within a legal framework, but rather, primarily, about control and order. To compensate for the legitimacy deficit, ruling elites – sheikhs, party nomenklaturas, military juntas and plutocrats – have resorted to religious rhetoric, revolutionary fervour, nationalist myths or fake historicity. As a result, the study of Arab politics has become, inescapably, an inquiry into corruption and pretence, a study of holy slogans and unholy practices, of dramatised theatrics and fluxes of despair, of deep seasons of killings punctuated by false dawns – in short, of great nations lost to repression and plunder cloaked in trappings of pomp and an air of political symbology. The sooner these regimes, which fare terribly on indices measuring corruption, human rights and the rule of law, are reformed, the better. Their stupendous ceremonials at home, official politesse at international forums, and public relations campaigns in Western capitals, now so de rigueur, should not blind us to the fact that the rule of gangs, or quasi-gangs, is immoral, dangerous, and very costly at every level. If the Khashoggi tragedy is seen as the climax of an encounter between a courageous journalist and an unprincipled politician, it will be repeated over and over again, as it has been countless times in the modern history of the Middle East. Only in context can the full picture be seen, the correct diagnosis made and the right remedy devised.